The Grey and White Star Children’s Collection is an elegant, gender-neutral and modern design which is sure to compliment all home interiors with a contemporary aesthetic. The Grey and White Star Children’s Collection consists of a toddler-bed designed for maximum support, an exciting desk area perfect for activities and coordinating table and chairs to accommodate multiple children. Crafted from durable materials, the Grey and White Star Children’s Collection is sure to last over time and combines sleep with play to provide an entire bedroom solution with coordinating design. The stunning grey and white star theme adds a timeless elegance perfect for all children’s bedrooms, with neutral design to welcome personal touches of decoration. The Grey and White Star Children’s Collection is manufactured for an easy self-assembly in a matter of minutes, with full instructions included in purchase. 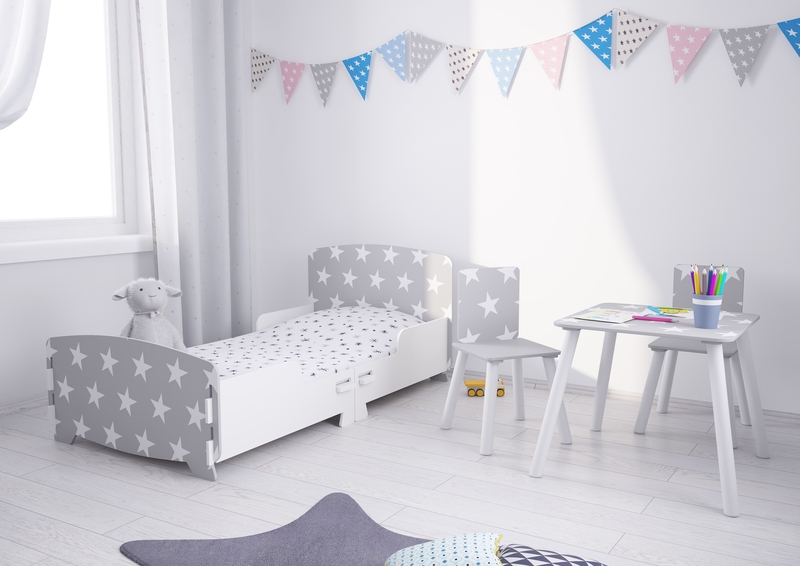 Flat-packed for efficient delivery, the gorgeous Grey and White Star Children’s Collection could be brightening up your home in no time!